Two participants of last year’s polar plunge. POMEROY — A local motorcycle club is challenging members of the community to take a plunge into the Ohio river. 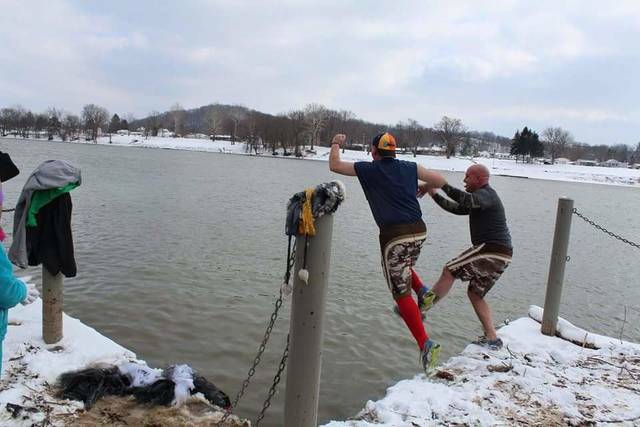 On Jan. 1 at 1 p.m. the Los Cuervos motorcycle club will be holding its third annual Meigs County Polar Plunge at the Pomeroy levee. Registration for the event will begin at 11 a.m. and participants must be at least 18 years of age and sign a waiver to be permitted to take the plunge. Wamsley shared the event has had around 25-30 participants each year and the parking lot filled with spectators. He said those participating may dress in costume if they wish. Wamsley expressed Los Cuervos has earned approximately $7,000 each year since the polar plunge began. Wamsley shared this event began on a whim. He said Los Cuervos was wanting to raise money for the Meigs County Dog Shelter and a fellow member of the club told Wamsley he could talk people into anything, so he suggested that people sponsor individuals to take a plunge into the Ohio River. “We have a lot of fun with this event, but are very serious about the safety of our jumpers,” said Wamsley. Wamsley shared that the temperature of the water has been 32 degrees Fahrenheit for the past two years. He said that members of Los Cuervos discourage anyone with health conditions from taking the plunge. Wamsley expressed that in case of an emergency volunteers are on standby to assist individuals out of the water along with members from the Meigs County EMS and the Pomeroy Police Department. He said that coffee and hot chocolate will be available at the event as well as two enclosed trailers, one for females and one for males, for those taking the plunge to warm up after their trip into the water. Wamsley shared that Los Cuervos is assisted by fellow members of the motorcycle clubs Meigs County Bikers Association and Revelatorz Benefit Riders INC. Los Cuervos will be handing out t-shirts at the event with a list of their sponsors on the back. He expressed that the proceeds for the event will be going to both the Los Cuervos motorcycle club as a means to help pay their rent, utilities, and future expenditures for donations to community causes throughout the new year and the Meigs Area Animal Rescue Foundation. Wamsley said the AARF is a fellow non-profit organization located on State Route 248 in Long Bottom that is taking care of rescued animals. “I am challenging every Meigs, Mason, Gallia and other surrounding county residents and businesses to stop by the Pomeroy Levee Jan. 1 at 1 p.m. to make a donation for these animals,” said Wamsley. https://www.mydailytribune.com/wp-content/uploads/sites/42/2017/12/web1_image20171226181524996-1.jpegTwo participants of last year’s polar plunge. Erin Perkin is a staff writer for Ohio Valley Publishing.